O you who are the friends of Christ, and the friends of the stranger, and the friends of the brethren, receive in kindness my speech today, and open your ears like the doors of hearing, and admit within them my discourse, and accept from me this saving proclamation of the baptism of Christ, which took place in the river Jordan, in order that your loving desires may be quickened after the Lord, who has done so much for us in the way of condescension. For even though the festival of the Epiphany of the Saviour is past, the grace of the same yet abides with us through all. Let us therefore enjoy it with insatiable minds; for insatiate desire is a good thing in the case of what pertains to salvation—yea, it is a good thing. Come therefore, all of us, from Galilee to Judea, and let us go forth with Christ; for blessed is he who journeys in such company on the way of life. 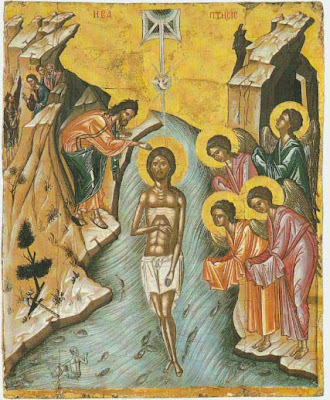 Come, and with the feet of thought let us make for the Jordan, and see John the Baptist as he baptizes One who needs no baptism, and yet submits to the rite in order that He may bestow freely upon us the grace of baptism. Come, let us view the image of our regeneration, as it is emblematically presented in these waters. "Then comes Jesus from Galilee to Jordan unto John, to be baptized of him." O how vast is the humility of the Lord! O how vast His condescension! The King of the heavens hastened to John, His own forerunner, without setting in motion the camps of His angels, without dispatching beforehand the incorporeal powers as His precursors; but presenting Himself in utmost simplicity, in soldier-like form, He comes tip to His own subaltern. And He approached him as one of the multitude, and humbled Himself among the captives though He was the Redeemer, and ranged Himself with those under judgment though He was the Judge, and joined Himself with the lost sheep though He was the Good Shepherd who on account of the straying sheep came down from heaven, and yet did not forsake His heavens, and Was mingled with the tares though He was that heavenly grain that springs unsown. And when the Baptist John then saw Him, recognising Him whom before in his mother's womb he had recognised and worshipped, and discerning clearly that this was He on whose account, in a manner surpassing the natural time, the had leaped in the womb of his mother. in violation of the limits of nature, he drew his right hand within his double cloak, and bowing his head like a servant full of love to his master, addressed Him in these words: I have need to be baptized by You, and You come to me? What is this you are doing, my Lord? Why do You reverse the order of things? Why do You seek along with the servants, at the hand of Your servant, the things that are proper to servants? Why do You desire to receive what You require not? Why do You burden me, Your servitor, with Your mighty condescension? I have need to be baptized by You, but You have no need to be baptized of me. The less is blessed by the greater, and the greater is not blessed and sanctified by the less. The light is kindled by the sun, and the sun is not made to shine by the rush-lamp. The clay is wrought by the potter, and the potter is not moulded by the clay. The creature is made anew by the Creator, and the Creator is not restored by the creature. The infirm is healed by the physician, and the physician is not cured by the infirm. The poor man receives contributions from the rich, and the rich borrow not from the poor. I have need to be baptized by You, and You come to me? Can I be ignorant who You are, and from what source You have Your light, and whence You have come? Or, because You have been born even as I have been, am I, then, to deny the greatness of Your divinity? Or, because You have condescended so far to me as to have approached my body, and bear me wholly in Yourself in order to effect the salvation of the whole man, am I, on account of that body of Yours which is seen, to overlook that divinity of Yours which is only apprehended? Or, because on behalf of my salvation You have taken to Yourself the offering of my first-fruits, am I to ignore the fact that "You cover Yourself with light as with a garment?" Or, because You wear the flesh that is related to me, and show Yourself to men as they are able to see You, am I to forget the brightness of Your glorious divinity? Or, because I see my own form in You, am I to reason against Your divine substance, which is invisible and incomprehensible? I know You, O Lord; I know You clearly. I know You, since I have been taught by You; for no one can recognise You, unless He enjoys Your illumination. I know You, O Lord, clearly; for I saw You spiritually before I beheld this light. When You were altogether in the incorporeal bosom of the heavenly Father, You were also altogether in the womb of Your handmaid and mother; and I though held in the womb of Elisabeth by nature as in a prison, and bound with the indissoluble bonds of the children unborn, leaped and celebrated Your birth with anticipative rejoicings. Shall I then, who gave intimation of Your sojourn on earth before Your birth, fail to apprehend Your coming after Your birth? Shall I, who in the womb was a teacher of Your coming, be now a child in understanding in view of perfect knowledge? But I cannot but worship You, who art adored by the whole creation; I cannot but proclaim You, of whom heaven gave the indication by the star, and for whom earth offered a kind reception by the wise men, while the choirs of angels also praised You in joy over Your condescension to us, and the shepherds who kept watch by night hymned You as the Chief Shepherd of the rational sheep. I cannot keep silence while You are present, for I am a voice; yea, I am the voice, as it is said, of one crying in the wilderness, Prepare the way of the Lord. I have need to be baptized by You, and You come to me? I was born, and thereby removed the barrenness of the mother that bore me; and while still a babe I became the healer of my father's speechlessness, having received of You from my childhood the gift of the miraculous. But You, being born of the Virgin Mary, as You willed, and as You alone know, did not do away with her virginity; but You kept it, and simply gifted her with the name of mother: and neither did her virginity preclude Your birth, nor did Your birth injure her virginity. But these two things, so utterly opposite—bearing and virginity—harmonized with one intent; for such a thing abides, possible with You, the Framer of nature. I am, but a man, and am a partaker of the divine grace; but You are God, and also man to the same effect: for You are by nature man's friend. I have need to be baptized by You, and You come to me? You who were in the beginning, and was with God, and was God; You who are the brightness of the Father's glory; You who are the perfect image of the perfect Father; You who are the true light that lightens every man that comes into the world; You who were in the world, and came where You were; You who were made flesh, and yet was not changed into the flesh; You who dwelt among us, and manifested Yourself to Your servants in the form of a servant; You who bridged earth and heaven together by Your holy name,—You come to me? One so great to such a one as I am? The King to the forerunner? The Lord to the servant? But though You were not ashamed to be born in the lowly measures of humanity, yet I have no ability to pass the measures of nature. I know how great is the measure of difference between earth and the Creator. I know how great is the distinction between the clay and the potter. I know how vast is the superiority possessed by You, who art the Sun of righteousness, over me who am but the torch of Your grace. Even though You are compassed with the pure cloud of the body, I can still recognise Your lordship. I acknowledge my own servitude, I proclaim Your glorious greatness, I recognise Your perfect lordship, I recognise my own perfect insignificance, I am not worthy to unloose the latchets of Your shoes; and how shall I dare to touch Your stainless head? How can I stretch out the right hand upon You, who stretched out the heavens like a curtain, and set the earth above the waters? How shall I spread those menial hands of mine upon Your head? How shall I wash You, who art undefiled and sinless? How shall I enlighten the light? What manner of prayer shall I offer up over You, who receives the prayers even of those who are ignorant of You? You are the Christ, the Son of the living God. By these words, as they were sent from the Father out of heaven in thunder-form, the race of men was enlightened: they apprehended the difference between the Creator and the creature, between the King and the soldier (subject), between the Worker and the work; and being strengthened in faith, they drew near through the baptism of John to Christ, our true God, who baptizes with the Spirit and with fire. To Him be glory, and to the Father, and to the most holy and quickening Spirit, now and ever, and unto the ages of the ages. Amen.